Many Baton Rougeans probably think the Council on Aging is a governmental agency, especially since they see a proposition on the ballot Tuesday to levy a 2.2 mill property tax, which would raise $79 million in new taxes for the Council on Aging. However, the Council on Aging is not a government agency but rather a private non-profit corporation whose board and officers are not appointed by or answerable to the Metro Council or any other governmental body. Nevertheless, it is funded almost entirely by taxes. Now the Council on Aging has taken on a new mission — as the political action arm of Hillary Clinton and the Democratic Party. Last week, the Council on Aging sent out from its office at 5790 Florida Boulevard a 37,000-piece to voters across the parish endorsing Hillary Clinton for President, Foster Campbell for U.S. Senate, Cedrick Richmond for Congress, Sharon Weston-Broome and Denise Marcelle for Mayor-President, and five individuals for Metro Council. All except one candidate for Metro Council are Democrats. The CEO of the Council on Aging is Tasha Clark-Amar, daughter of District Judge Janice Clark. The mailing urged recipients to vote for the new $79 million property tax for the Council on Aging. The mailing from the COA office used Non-Profit Mailing Permit No. 523, which is registered to the Council on Aging. The mailing was done at the non-profit mailing rate, rather than normal bulk rate. The office of the Council on Aging at 5790 Florida has a large sign out in front of the building urging voters to “Support Our Seniors” and “Vote Yes” on the tax increase. The Council on Aging’s Facebook page urges viewers to Vote Yes on the tax increase. The Council on Aging’s website, www.ebrcoa.org, features at the top of the home page a large sliding banner urging voters to Vote Yes for the tax increase. 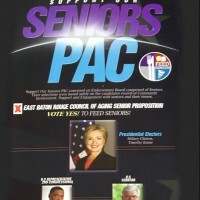 A separate website for Support Our Seniors PAC urges viewers to Vote Yes for the tax increase. It lists its mailing address as 5790 Florida Blvd., the same as the Council on Aging, which occupies the entire building. The website of Support Our Seniors PAC also lists its phone number at 225-923-8000, the same as the Council on Aging number. 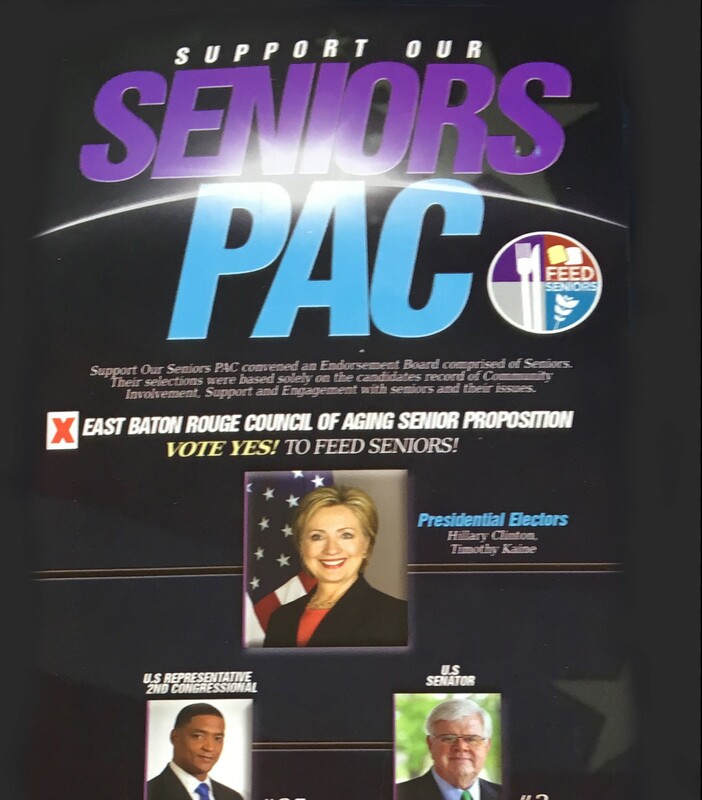 The Statement of Organization for Support Our Seniors PAC filed with the Louisiana State Board of Ethics lists the address of the PAC as 352 Napoleon St., Baton Rouge, which is the same address as Ourso Beychok, one of the top Democratic political consulting firms in Louisiana. The company, owned by Trey Ourso and Michael Beychok recently won national awards for its attack ads against Sen. David Vitter when he ran for governor last year. The firm organized Gumbo PAC, which spent millions to defeat Vitter. According to reports filed by Support Our Seniors with the Board of Ethics, the Council on Aging contributed directly to the PAC. Clark-Amar said those funds were contributed by employees of the Council on Aging, who have a deduct program, which deducts a contribution for political purposes from their salaries every month. On Friday, the Council on Aging held a rally at the Atrium of the Belle of Baton Rouge Casino in Downtown Baton Rouge with an estimated 1,000 people in attendance. The event featured numerous gifts and a raffle. Buses were on hand to transport individuals from the rally at the casino to participate in early voting. Attendees who agreed to ride the bus were given free raffle tickets. Hundreds of attendees were transported to vote in this manner. Those transported were given sample ballots on how to vote by the Council on Aging, according to a source who was there. Campaign finance reports do not show who paid for the buses. Louisiana’s Anti-Vote Hauling law prohibits the mass hauling of voters to the polls but has an exception for public transportation ordinarily used to transport people commercially. On Monday, another five large school buses were used to transport people to the State Archives Building to vote. A Metro Council member endorsed by the Council on Aging said the voters were picked up at Community Centers feeding programs and transported to vote. On Monday, the buses were provided by First Student, a private transportation company that contracts with public school systems in the Baton Rouge area. One of the school buses that pulled up to the State Archives Building full of adults was from the Central Community School System. Its presence resulted in phone calls to Central schools Supt. Mike Faulk, asking why one of the school system’s buses was hauling voters to the polls for the COA tax and Hillary Clinton. That reportedly resulted in an angry call from Faulk to First Student telling them that if another bus from the Central school system was used in that fashion it would result in Central’s cancelling their contract. A regional vice president of First Student reportedly apologized and said his office had no knowledge the bus had been used in that way. On Tuesday, Nov. 1, the Council on Aging continued to use buses to haul people to the State Archives but this time no buses from First Student were seen. Instead, all of the buses appeared to come from CATS, the government-run bus company in Baton Rouge. So far, no reports have been filed on who paid for those buses. One source close to the Council on Aging said the hauling of voters to the polls will continue on election day but on a larger scale. The source said, “This is Hillary Clinton’s voter turnout machine in East Baton Rouge. We know we can’t get African Americans to turn out for Hillary. So we are using the Council on Aging tax as a way to promote turnout,” the source said. The largest donor to Support Our Seniors PAC is Amerigroup, a multi-billion dollar insurance company that administers Obamacare insurance policies. The Council on Aging’s entry into politics has produced a backlash. Most elected officials in the parish are conservative Republicans and many do not appreciate the COA’s new direction. The Advocate reported that the 37,000-piece mailing violated postal regulations by using a non-profit mailing permit for a political mailing. WBRZ-TV investigative reporter Chris Nakamoto also exposed the misuse of the mailing permit. “I told Ms. Clark-Amar that by turning the Council on Aging into a political organization, she has assured that Central will strongly oppose her proposed tax increase,” Shelton said. Baton Rouge attorney Chris Alexander said he has a client who is deeply concerned about the COA’s actions and is considering legal action. Another attorney said the COA’s actions have been so extreme that they threaten the organization’s tax exempt status. “I would not be surprised if their tax exempt status were revoked. That would result in the potential loss of services to seniors in our parish. So another more responsible organization would be recognized, and funding would be directed to them,” he said. • Federal tax laws which prohibit tax-exempt organizations from supporting or opposing candidates for public office. • Federal campaign finance laws, which prohibit corporations from supporting federal candidates, which in this case would be Hillary Clinton, Foster Campbell, and Cedric Richmond. • Violation of the Louisiana Constitution and state statutes, which prohibit the use of public funds to urge any elector to vote for or against a candidate or proposition on the ballot.